Multiple sclerosis (abbreviated MS, also known as disseminated sclerosis or encephalomyelitis disseminata) is an inflammatory disease in which the fatty myelin sheaths around the axons of the brain and spinal cord are damaged, leading to demyelination and scarring as well as a broad spectrum of signs and symptoms. 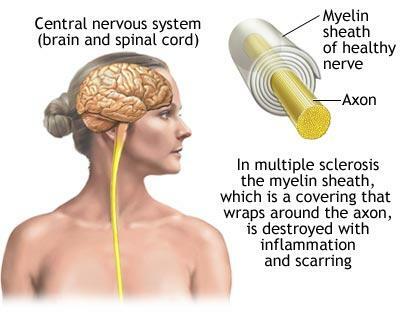 Disease onset usually occurs in young adults, and it is more common in females.MS affects the ability of nerve cells in the brain and spinal cord to communicate with each other. Nerve cells communicate by sending electrical signals called action potentials down long fibers called axons, which are wrapped in an insulating substance called myelin. The relapsing-remitting subtype is characterized by unpredictable relapses followed by periods of months to years of relative quiet (remission) with no new signs of disease activity. Deficits suffered during attacks may either resolve or leave sequelae, the latter being more common as a function of time. This describes the initial course of 80% of individuals with MS.
One type of stem cell, the mesenchymal stem cell, has immune regulatory properties. It is thought that through their regulatory effect on the immune system, they may help stop the immune attack on the myelin sheath. 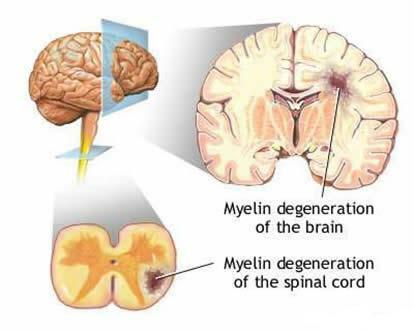 Mesenchymal stem cells may also potentially help remyelination (re-generation of the myelin sheath) of the affected neurons.